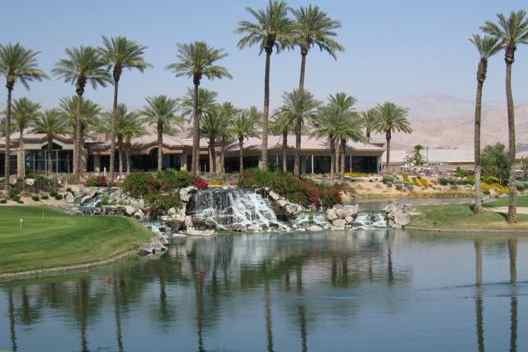 Sun City Palm Desert is the ideal retreat for retirees who want an active lifestyle community in the desert. Sun City Palm Desert was developed by Del Webb between 1992 and 2003. It was the first 55+ community in the Palm Springs area and is also the largest in the desert with grounds that span 1,600 acres. The development was originally named Sun City Palm Springs, but the name was changed as the community neared completion. Today, Sun City Palm Desert includes 4,949 homes, which are now available on a resale basis. Resort-style amenities at Sun City Palm Desert are spread across three inviting clubhouses. The largest facility, Mountain View Clubhouse, is 77,828 square feet and is home to the Mountain View Golf Club. This impressive facility offers plenty of space for social and recreational activities. There are multiple restaurants, a coffee shop, a multi-purpose ballroom and several meeting rooms. Hobby and game rooms at the Mountain View Clubhouse support many different interests. These include a card room, a computer lab and a fitness center, as well as arts and crafts studios for specific interests such as ceramics, sewing, stained glass and woodworking. There's even a post office. Outdoors, the Mountain View Clubhouse offers two 18-hole championship golf courses and a driving range. 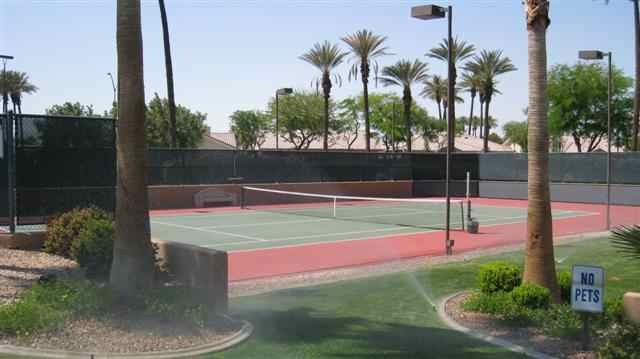 There are also ten tennis courts, four pickleball courts and an outdoor pool and spa area. Residents can break a sweat on one of ten tennis courts while enjoying the warm climate. Sun City Palm Desert also has two more recreational facilities: the 25,000 square-foot Sunset View Clubhouse and the 16,000 square-foot Lakeview Clubhouse. These buildings provide additional amenities including fitness centers, meeting rooms, swimming pools, bocce ball courts and a fishing lake. The community's beautiful grounds also feature two paddleball courts, shuffleboard courts, a softball field, an RV parking area, scenic ponds and a playground for visiting grandchildren. When it comes to homes, Sun City Palm Desert features styles and prices to meet the needs of nearly any active adult homebuyer. These resale homes were originally offered in over 40 different floor plans, including both attached and detached designs. Homes typically range in size from 1,000 to over 3,200 square feet and many were built with desirable features, such as gourmet kitchens and spa-like bathrooms. Beyond its fabulous on-site amenities, Sun City Palm Desert offers a prime location in the Coachella Valley. Residents are within easy reach of shops, restaurants and other attractions throughout the Palm Springs area. It's a truly beautiful place for upscale, resort-style living.